1. Lightweight Electric Scooter is made of Aluminum alloy, environmentally friendly travel tool. 2. High-capacity 6000mAh 18650 Lithium Ion Battery, battery lifespan of over 500 cycles; three gear speeds(max speed 30kmh), Range 25 km per charge, 250W motor power. 3. Multifunction electronic display, accurate display of current, voltage, time, battery capacity, speed grade, instantaneous speed, total kilometers traveled. 4. Cool LED lights, Double brake design(Electronic braking system & Mechanical brake), horn design, convenient and safe driving. 5. Rear wheel cover buckle design, folds conveniently for transport. 6. Free inflatable solid wear-resistant front tires, non-slip handle design, lightweight, weighs only 24.25lb / 11kg. This two wheels electric scooter is a good environmentally friendly travel tool, avoiding the traffic jam. Easy to assemble handles and fold, it's not only a good helper for office worker, but a great accompany to enjoy fun in life. 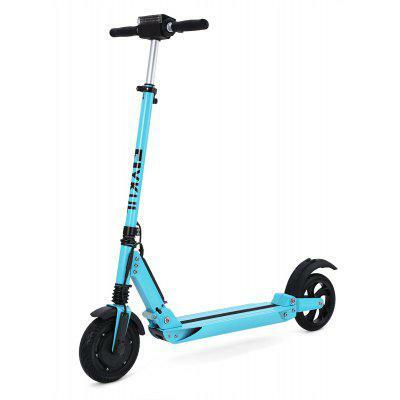 The electric scooter is crafted from Aluminum alloy making it sturdy. The mini compact design and easy-fold function mean you can bring it up on public transport conveniently. It is fast folded and expanded, also easy for you to store it in your car, house and so on. The stylish front lights can light up the path ahead at night for safety. When you do not need it at day, just press the button. And, the horn design can make attention when there is some cars or persons before you, making you safe in driving. Easy and convenient to use. A Multifunctional electronic display, accurately shows the current, voltage, time, battery capacity, speed grade, instantaneous speed, total kilometers traveled. You can know about your driving conditions. There are three gear shifts (L1, L2, L3) for riding, and you can change your gear shift when needed. There are two braking systems for you to choose: Electronic braking system & Mechanical brake. You can choose one to control your riding or stopping. Easy & convenient & safe. It is designed in the middle of the rear wheel cover. When folded, a gently buckle can make it directly stuck, easy to carry. While expanding, gently press the rear wheel cover, lever can be raised up, expand the scooter. Simple to carry when unused. High-capacity 6000mAh 18650 Lithium Ion Battery, the scooter can riding for 25 km mileage per charge, battery lifespan of over 500 cycles. While there is no operation at the electric display and the speed dimmer is completely slack over 90seconds, the system will be power-off by itself, stay in power saving. Press on the power button, it will be reset up. With a smart Battery Management System, you need not worry about overcharging or battery malfunctions. Battery life: 500 charging cycles. Configurations: LED lights, Multifunctional display, Double brake system, Horn, Rear wheel cover buckle. Want to be notified when the Flykul 8 Inches Foldable Lightweight Electric Kick Scooter gets even cheaper? Make sure you snag the best price by entering your email below. We'll email you when the price drops, free! We're tracking the price of the Flykul 8 Inches Foldable Lightweight Electric Kick Scooter every day so you know if that deal is really a steal! Check back for to check the best price for this product - and whether its current sale price is really the cheapest it's been! No Flykul 8 Inches Foldable Lightweight Electric Kick Scooter coupons found!